My first experience booking with Korean carriers was not routine. Some of the problems you face: you need to install a 3rd party app in order to make a payment, some of the airlines require you to use Internet Explorer and only local language available for domestic flights. How did I work out my issues? Read on to find out! I searched on the internet for information of these airlines, including trip reports, but most of them were out-dated so that made me decide to do one based on my experience. 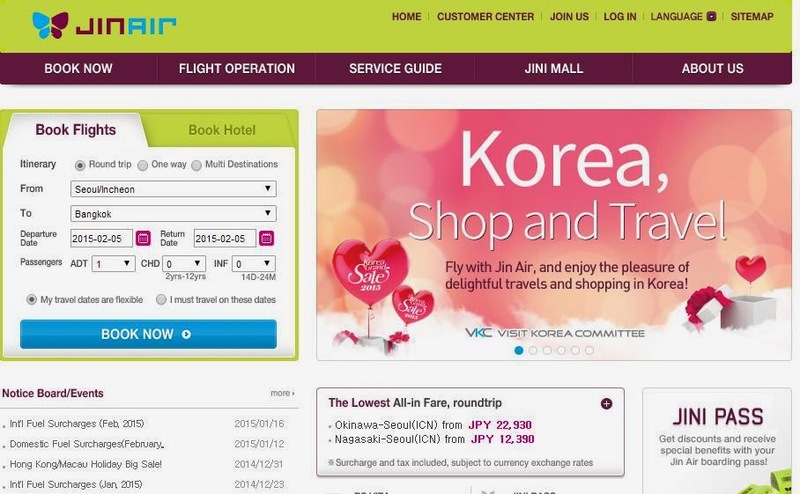 All the carriers except Jin Air have mobile application (IOS). Mobile app with Engiish version: Asiana Air, Korean air and Jeju Air. Since I am using an Apple phone, I review only the IOS mobile apps. Sorry about that! 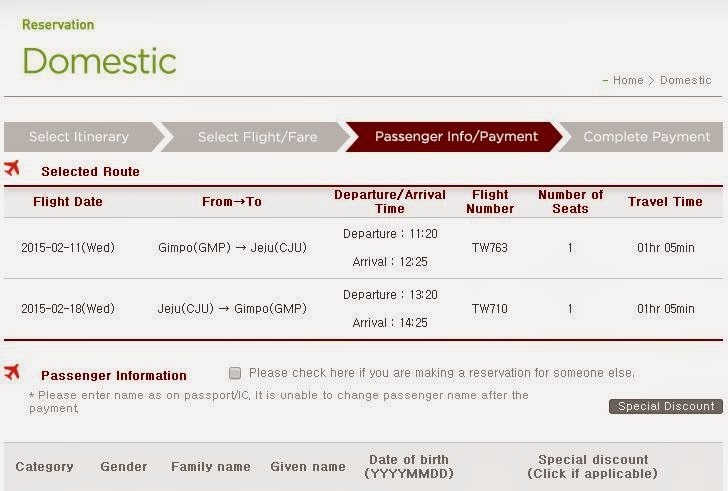 For Jeju Air and Korean Air, I had to use Internet Explorer to make my booking (In 2014), Asiana Airlines didn't work for me, while Eastar Jet, Air Busan and T'Way flights were booked using Chrome Google. 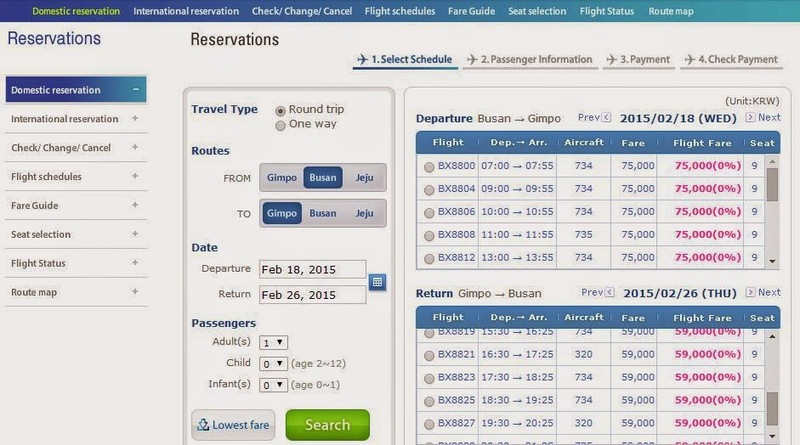 In 2015, Jeju Air and Korean Air flights were booked using Chrome Google and had no issue. 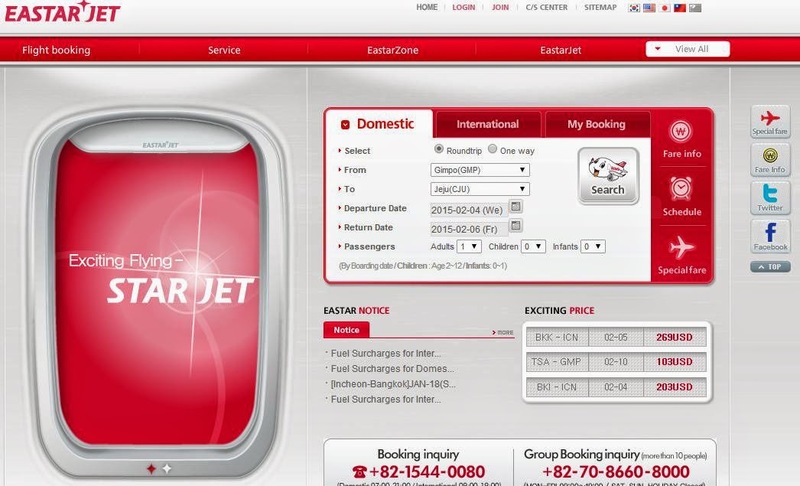 I did dummy booking with the carriers' websites; Eastar jet and T'way surprised me this time. It's like a merry-go-round; One website is fixed, the other has issue. According to a reader, he told me that if you are a Macintosh user, its a pain to do internet transaction, as they have lots of Microsoft and its ActiveX files to download. 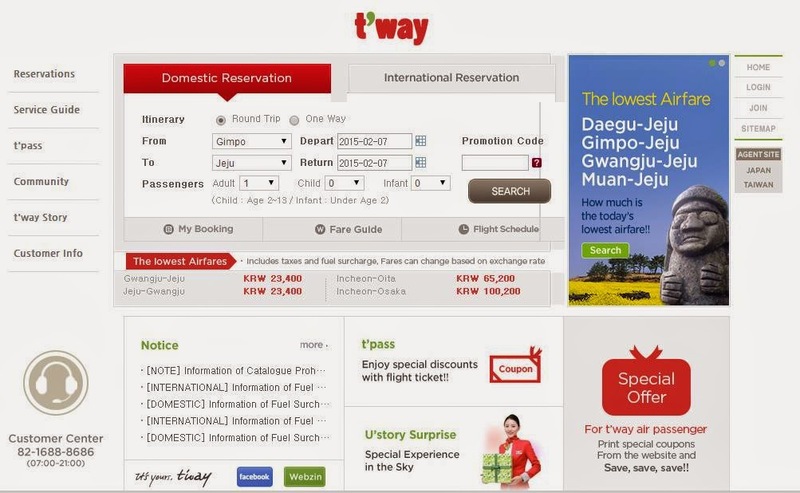 Here is my short review on the airlines' history and websites including the mobile app. This airline is a Low Cost Carrier set up in Busan, its a subsidiary of Asiana Airlines, set up to compete with the other Low Cost Carriers in South Korea. It was set up in 2007 and was launched in October 2008. The airline operates aircraft from Asiana Air - Boeing 737-400 and Boeing 737-500 then later on Airbus A320 and Airbus A321 joining the fleet. 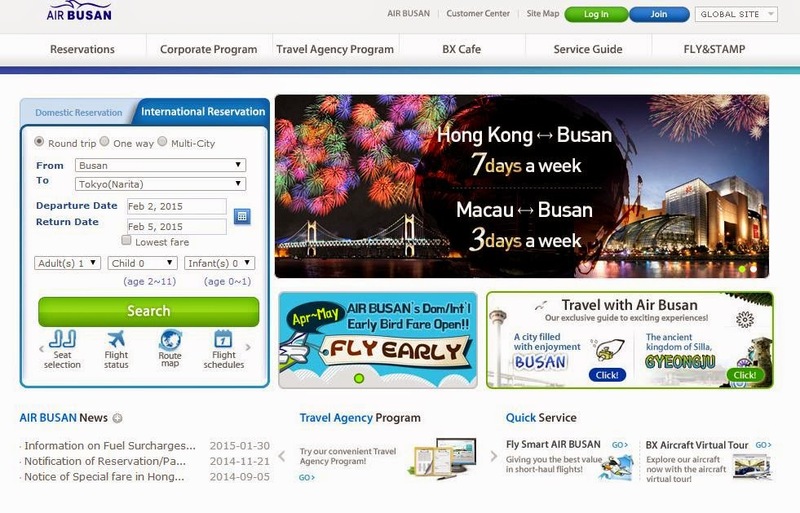 This airline has its own separate website and its much more user-friendly than its parent's airline, Asiana. Booking with this airline using chrome was not a problem for me, there wasn't a need for me to install any 3rd party software to make my booking. Its quite user-friendly and this website is one of the easiest to navigate and get my booking done. If you stay longer in a foreign country, the more expensive the airfare would be. As this airline is quite popular with foreigners, airfares are charged in USD and from what I heard, they are doing quite well on certain routes. I haven't flown with this airline on an international route, but from my experience, this airline is certainly worth a try especially flying on the Airbus A321 - very generous legroom space. I like how the airline does with the domestic reservation page. 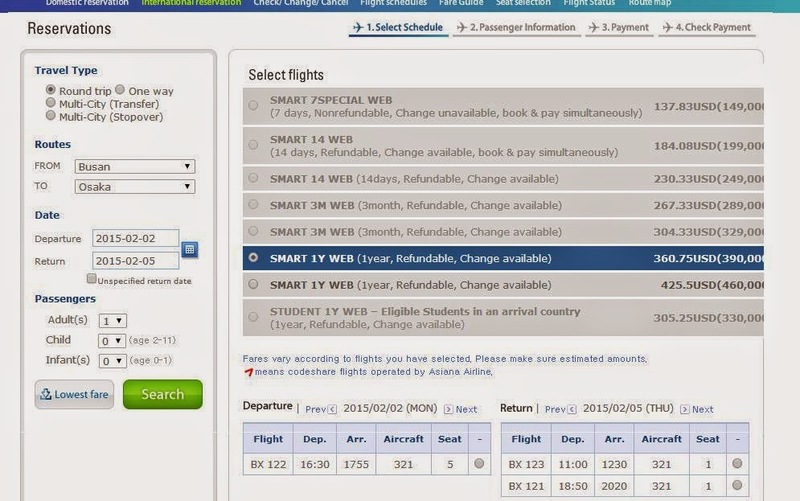 Choosing of flights is very easy; with all the information you need to know are in the same row. You can play around with the routes and the display would changed accordingly and very quickly too. Overall, this airline has the best website among the carriers. You shouldn't have any difficulty making your booking. Unfortunately, its only in Korean. So I didn't bother exploring it. Good news is the website is user-friendly, so do the booking via the website. This airline is one of the 2 major airlines in South Korea, the other airline is Korean Air. This airline was formed by Kumho Asiana Group and was formerly known as Seoul Air International. Asiana Airlines was established in February 1988 and started operation in December on the same year. 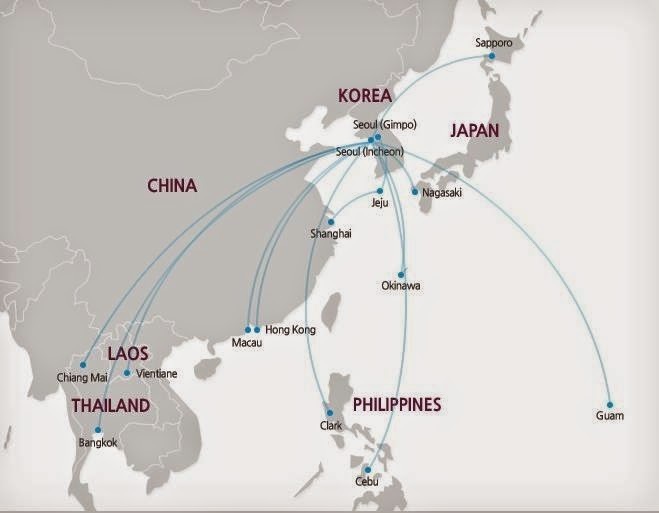 The first route was to Busan (Domestic flight). Initially operating with a Boeing fleet of 737 Classics, Boeing 747-400, Boeing 767-300ERs, later on Boeing 777-200ERs, Airbus A321, Airbus A330-300s and then Airbus A380-800 joined the airline's fleet. With an order of Airbus A350s joining the fleet in the near future, the airline would be operating more Airbus aircraft than Boeing. The airline's headquarters is in Seoul. 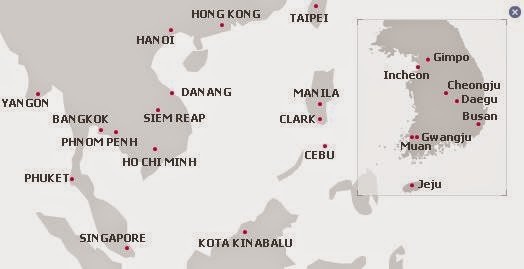 The domestic flights are based in Gimpo while the international ones are in Incheon. This airline also operates Cargo operation, with a fleet of Boeing 747-400 Freighters. 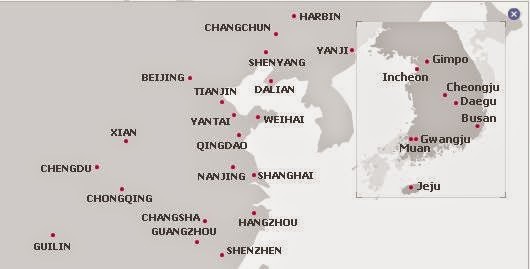 The airline is a member of the star alliance since January 2003 and have code-shares with other airlines in the same alliance on routes from Seoul to other regional cities especially. The interface of the website has changed since the last time I used it (2014), I thought this improved website would be better, but apparently not. I have no problem choosing choose the destination and dates. This interface is pretty cool especially with the aircraft type listed. Payment has to be made? No problem, I am more than willing to confirm my booking. 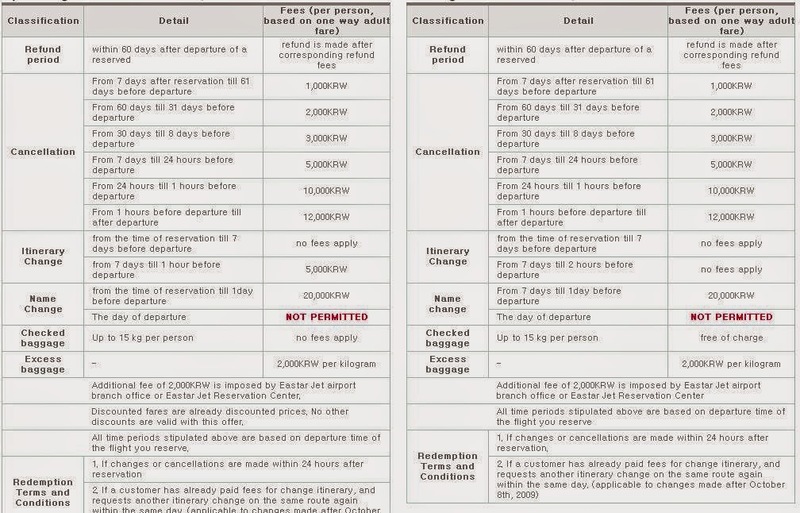 Once selected, its best to register with the airline in order to take advantage of the discounted price. You can't use other star alliance membership to do so, the only way is to redeem miles only if the flights are available. It cost around 5,000 points plus airport tax to do it. The problem I had was when I click on the purchase button, the page froze and it didn't process my booking. Later on, I found out that the website only recognise some credit cards, so I guess mine was not in the list. The airline doesn't need my business, I guess. Many of us have complained how bad the website is, but nothing seemed to be done to make this a painless experience for us. Its rival, Korean Air has certainly done something. If you are fed up with the website, you can either book your air ticket with the local office or from an on-line travel agent. Don't waste too much time trying to figure out this website, not worth it. You can check your booking with airlines using Amadeus or Sabre through this application. 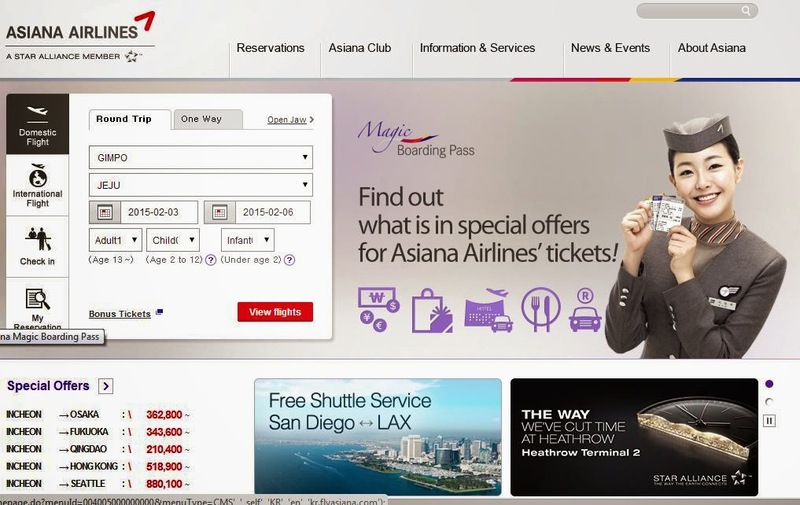 Booked with Asiana Airlines? Choose your seat by using this website. Some things to take note after making your booking especially via a 3rd party. This application is no better than the website. Its slow, you need to sign-in and also install a 3rd party app in order to make your payment. I gave up booking with this airline on the domestic flight since it was so frustrating to do so. The reason why I wanted to book with the airline's webpage because of the cheap fare and I wasn't prepared to pay more than U.S$100 for a one-way 50 minute domestic flight which the 3rd party websites were offering. 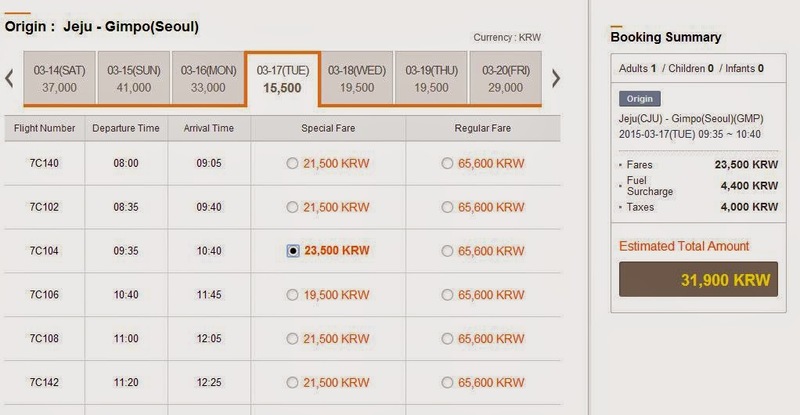 This airline is a Low Cost Carrier based in Seoul, South Korea. The airline was formed in October 2007 and started operation on August 2008. Its first flight was operated with a Boeing 737 on Seoul Gimpo to Jeju route and subsequently more domestic routes were introduced. The first international flight was to Kuching and then Phuket, competing with the local rivals. The airline has impressed others with its great cabin, scheduling and operation service. 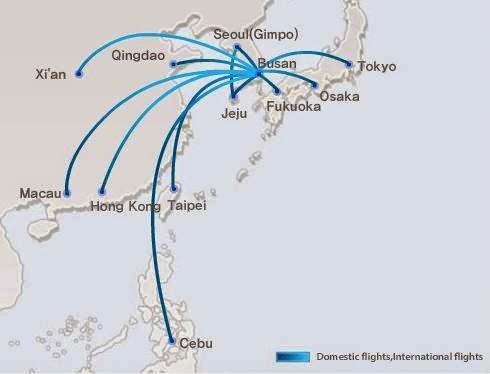 Domestic flights: Gimpo - Jeju- Gimpo, Jeju- Cheongju- Jeju and Jeju-Gansun-Jeju. It's pretty basic but I had no problem booking it and checking my reservation using both Ipad and my laptop. 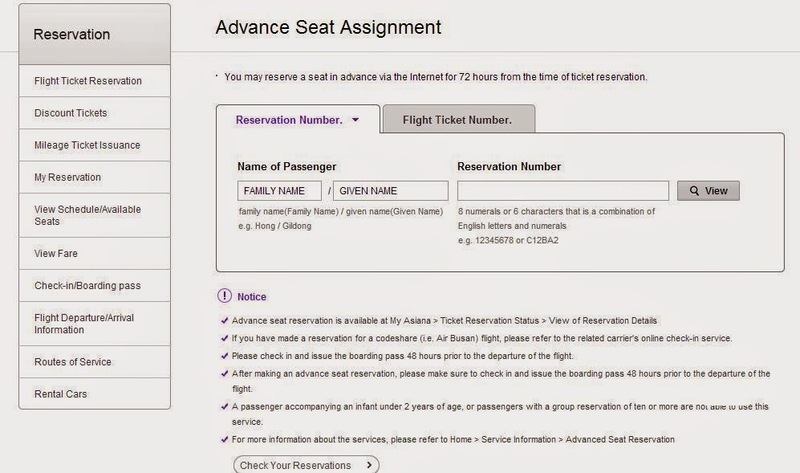 With the English version, foreigners will find booking with this airline as easy as ABC. However, payment has to be made via a 3rd party. Once you installed it, just follow the rest of the instruction to get it done. This airline offers very low fares and you get to choose to fly either Boeing 737-700 or -800. 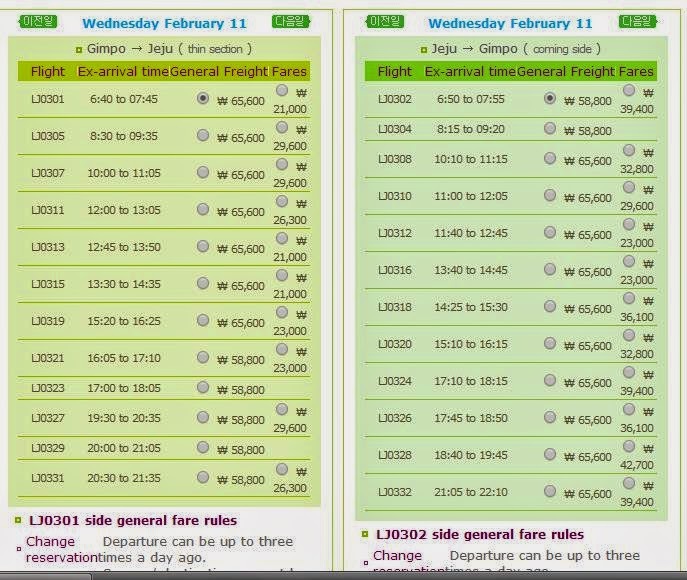 Do take note that special fares listed are only for registered users and its free to register. The extra minutes to fill up the form is worth it, trust me. The conditions are stated quite clearly, so if you read them carefully, you shouldn't face any problem. This is so troublesome! The last time I booked with this airline, I didn't have to install this program for my both domestic and international flights with this airline. 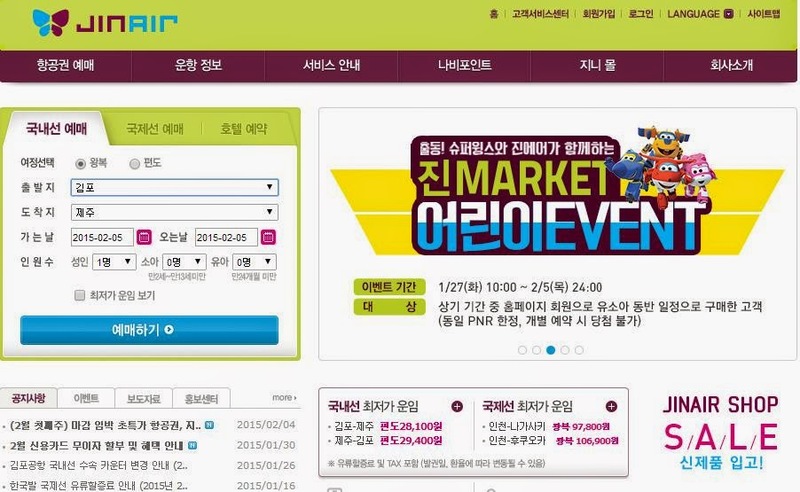 Just like Air Busan, it is in Korean language so I didn't use it. This is how the mobile app looks like. 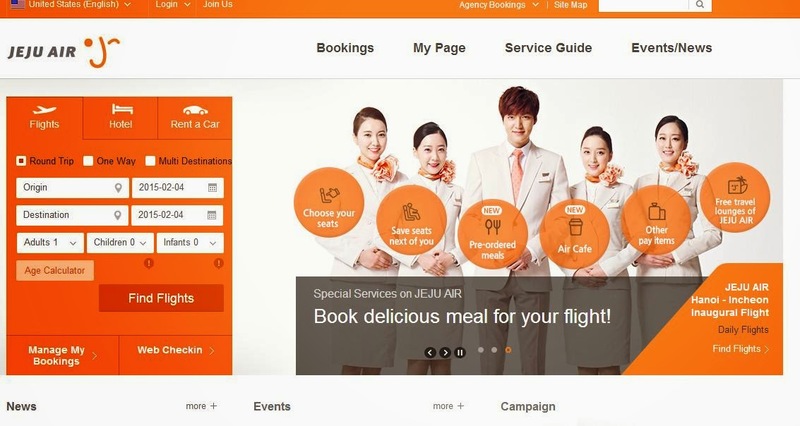 This airline is based in Jeju, South Korea and was established in January 2005. It started flying in June the following year. Operating a fleet of solely Boeing 737-800s, it flies on both domestic and international routes and made its name among the carriers for being reliable. It operated 5 Dash-8 for a short period before being withdrawn. The airline is doing pretty well, getting healthy loads on most of the international routes. It will also be taking delivery of another few more Boeing 737-800s from Ryanair, leased from lessor. The last time I used this airline's website, I had problems making the payment and had to use Internet Explorer to do so. However, this time, I had no such problem. I didn't need to download any 3rd party software to make the payment. The airline has certainly made an improvement to its website. Once again, in order to take advantage of the special fare, you need to sign up to be a member. 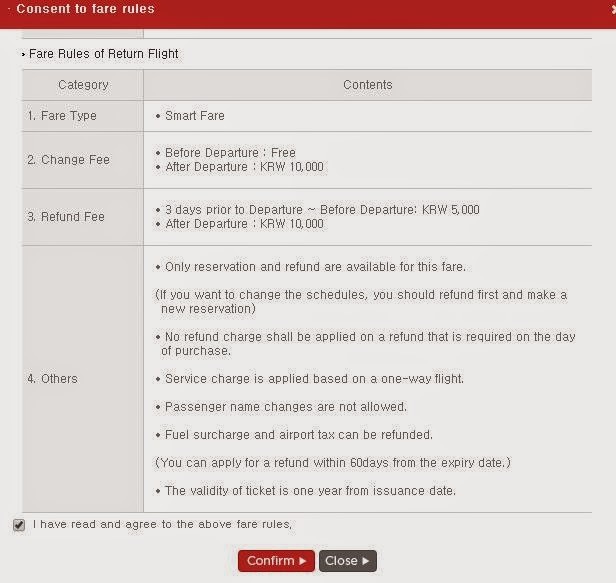 Special fare makes its very attractive to fly on the airline's domestic flights. 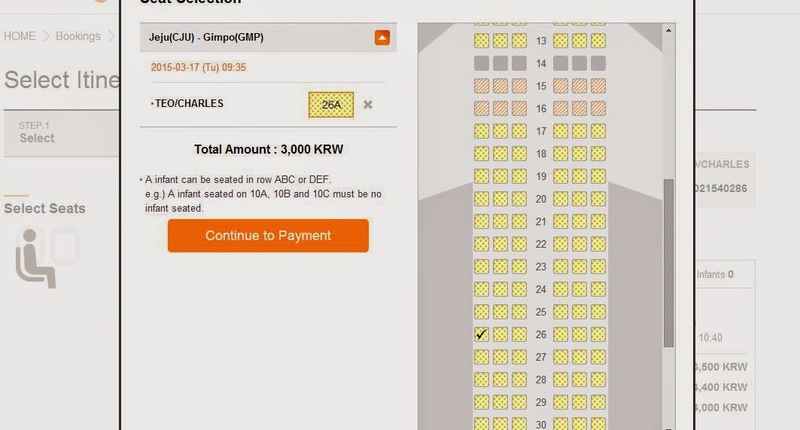 You can choose your seat at a cost of 3,000 KRW (Around U.S $2) for normal seat and 5,000 KRW (Around U.S $5) for emergency row seat. Now, its time for the payment. Do be careful not to miss out any information, if you do, you have to start all over! It happened to me a few times before finally confirming my trip. An email of your confirmation booking is sent to you, once your booking is confirmed. English version is available. Are you a fan of this Korean idol? The layout is quite similar to the web version. There is an option menu for you to refer to. Overall, this is a good application. I haven't used it yet so I can't comment. If you have booked using the mobile app, do share your experience with us. This airline is formerly known as Air Korea, and is a Low Cost Carrier set up by Korean Air. It began operation in June 2008 on domestic routes and then regional routes in October 2009. 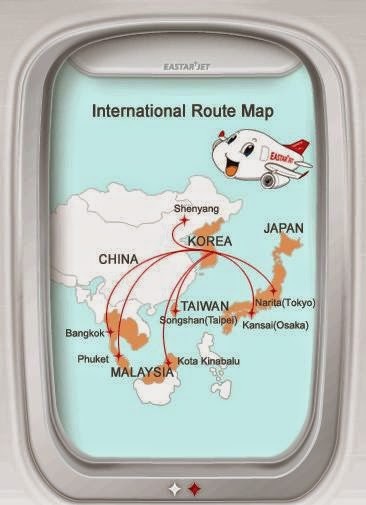 The inaugural flight of this airline is Seoul Gimpo to Jeju on 17th July 2008, using a Boeing 737-800. It has recently introduced the first wide-body, the Boeing 777-200ER which comes from its parent airline, Korean Air. It started daily flights to Guam and will introduce more routes when more 777s enter the fleet. I haven't booked with this airline on its international flights, so I can't comment. 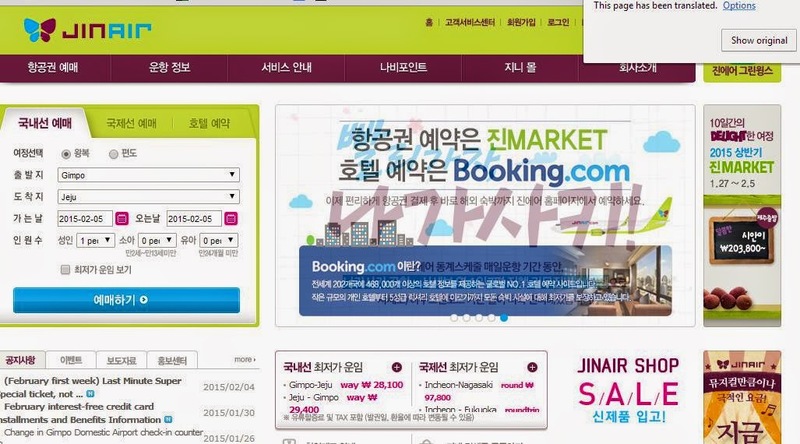 I tried booking on the airline's domestic flight on Gimpo to Juju route, but failed. Using goggle translation and don't seem to help much as most of the contents remained in Korean especially the payment page. 3rd party software was required and I could neither read or installed it, so I gave up and decided to make my booking at the airport instead. Purchasing at the airport would be more expensive. 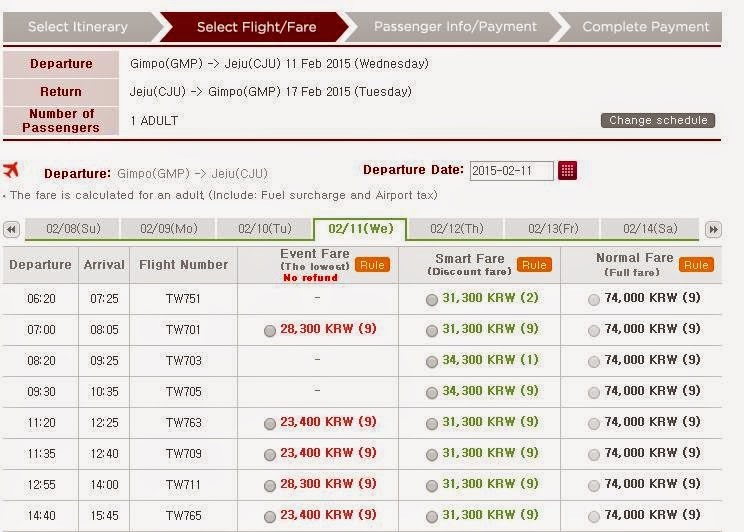 How much more, I let you know again on my trip report with Jin Air which would take place in March 2015. This is the English version, only International flights are available. 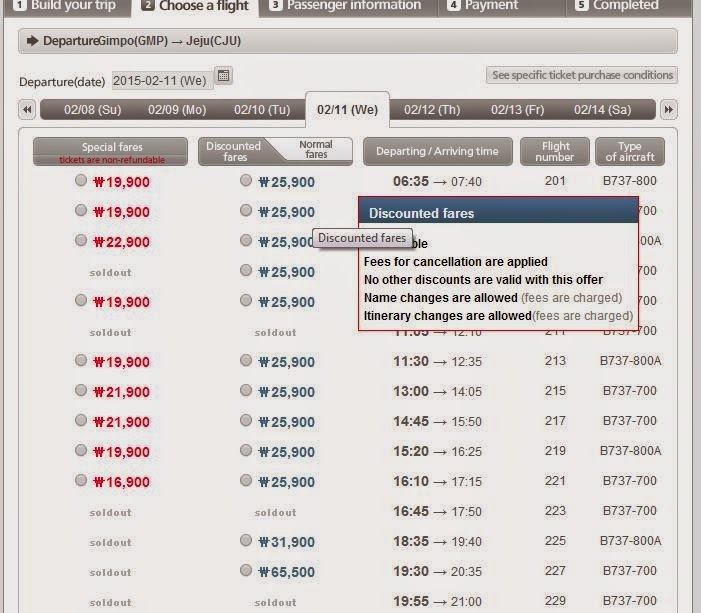 If you want to book domestic flight with this carrier, you have to use goggle translation. It doesn't translate the pop-ups. This is how much goggle translation can help. The rest, you have to try to guess, so its best to have someone who has a knowledge in this language to go through this process with you. Once, I was at the payment page, I got stuck and couldn't make the payment. Pure frustration! Korean Air is the flag carrier airline of South Korea with the largest fleet among all the carriers. This airline was originally founded as Korean National Airlines in 1946 and was replaced by Korean Air Lines in 1962. It was fully privatised by 1969 and started commercial airlines on 1st March 1969. Long haul flights started in April 1972 and LAX (Los Angeles) was the first destination. In March 1984, the airline's name was changed to its current, Korean Air. In the past, this airline was not permitted to fly over North Korea and Soviet's airspace, so they had to make a huge detour for flights to Europe. 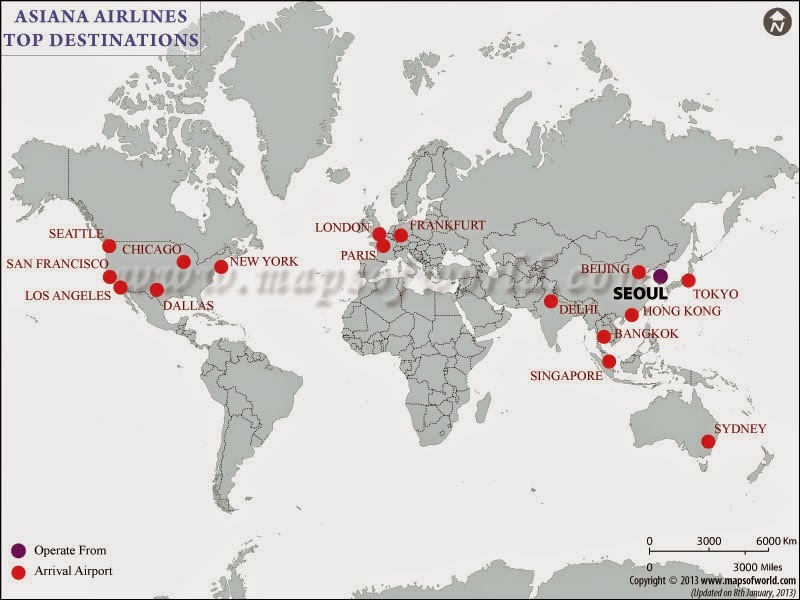 One example: Gimpo-Anchorage-Paris. This airline is one of the founding members of Skyteam alliance and is also a parent of Jin Air. This is a definite improvement over the old one. Its better to use the desktop to make your booking. I tried using my Ipad, but it didn't work properly. 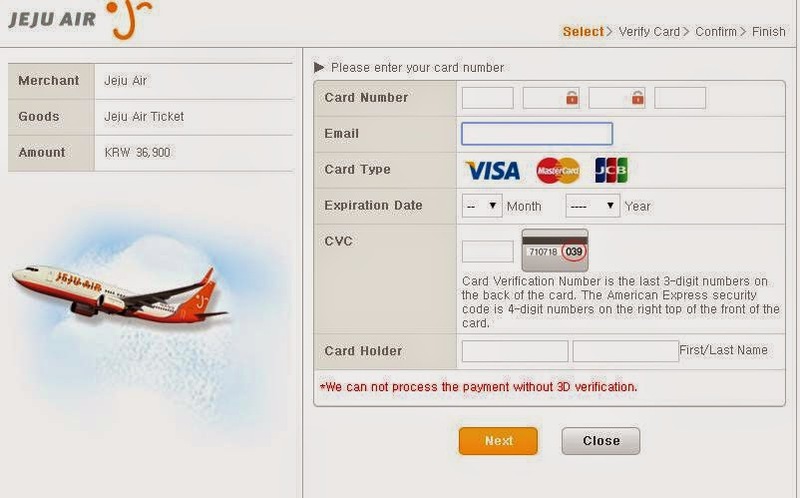 You have an option to either use miles or credit/debit card to pay your air ticket. You have to use the airline's Skypass card to do so. I find this to be quite user-friendly. How many of your family members or friends are going and what class do you wish to fly on? This is pretty neat. You can choose to fly one-way Economy class and the return on Prestige class, of course the air fare will be adjusted accordingly. One troublesome part about this is that you have to click on the flight details to be able to see what aircraft type the flight is operating. Do take note that airlines can change the aircraft type due to operational reasons. If you want to take advantage of the airline's low fare especially on domestic flights, remember to log in or create a free account with Skypass. Remember to choose the Non-Korean Credit/Debit Card option before keying in your Credit Card details and there you go, your booking is done. No 3rd party software is needed, unlike the previous website. Well done, Korean Air! This is what I like about the app, you can use your Touch ID to login, so convenient. The interface of the app is user-friendly, and it works without a glitch. Looks similar to the website's version, right? 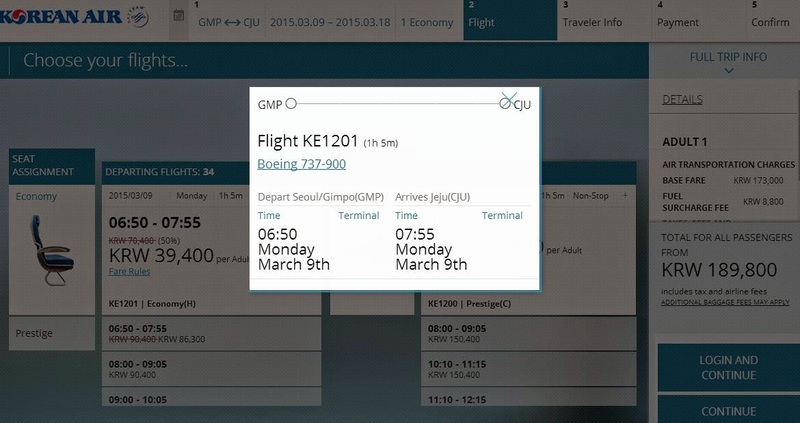 I did a booking on Korean Air's domestic one-way sector with the mobile app, no problem at all. Well done to the airline for improving both its website and mobile app. This airline was set up in August 2008 with 2 Boeing 737-800s. 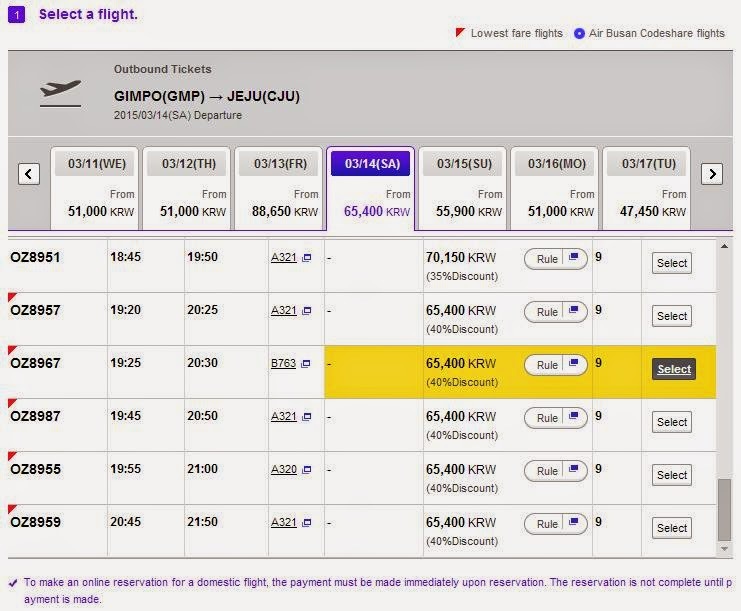 It started flights a month later and the first route was Gimpo to Jeju. This airline was formerly know as Hansung Airlines and after 3 years, it managed to achieved a profit and recorded the highest load factors between Gimpo and Jeju route in 2014. The website is basic and at that time I had no problem doing the booking. Somehow when I tried to do a dummy booking, I managed to get to the last page and when I clicked on the 'pay' button to get to the payment page, it stopped there and despite refreshing it a few times, it didn't work. Similarly to the other carriers, sign up to take advantage of the low fare. See the difference between the fare? So a bit of effect from your part will help you save a bit of $$, but do take note of the terms and conditions before making your booking. There will be a pop-up like this below, so click on it, sign in (register if you don't have an account) before confirming your itinerary and making the payment. 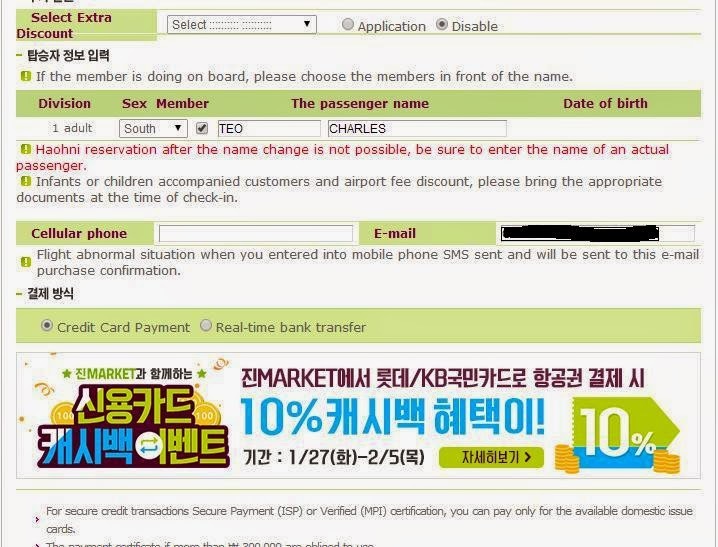 Once you are logged in, the details would be shown below and you just need to make your payment and that's it. If goggle chrome doesn't work, try Internet Explorer. Only available in Korean language. *Update: Good news! The Government has decided to put away the Active X Security Requirement which makes booking with these airlines much easier! Feel free to update me if there are any changes or mistakes.